Offset is an American rapper, singer, songwriter, actor, and one of the three-man hip hop group known by their stage name Migos. The group became famed after their debut single Versace (2013) went viral and was on No. 99 of the US Billboard 100 chart. His group has since dropped three studio albums and they are gunning for the fourth one. Offset, on the other hand, has one album to his credit whose single Ric Flair Drip got 3 times platinum while banging the charts. 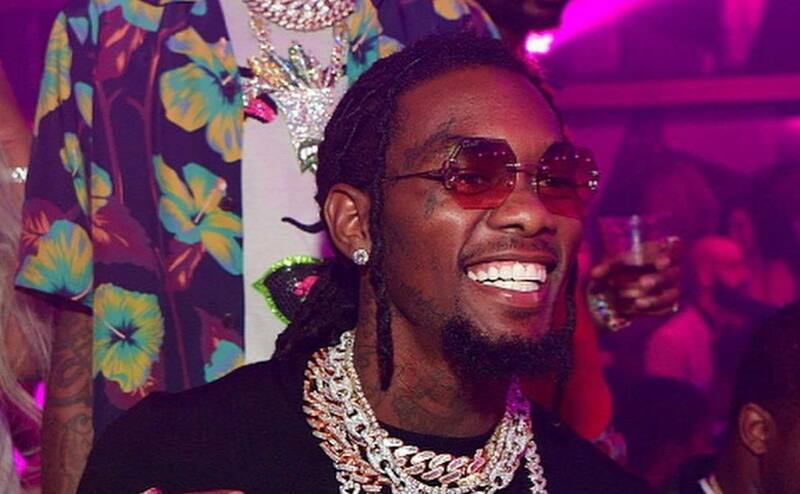 Offset is an African-American whose birth name is Kiari Kendrell Cephus and was born on December 14, 1991, in Lawrenceville, but raised in Gwinnett County, Georgia, USA. The names of his parents and their occupation are not known, however, he was raised solely by his aunt alongside his cousin, Takeoff. He schooled at Berkmar High School in Lilburn, Georgia, where he graduated from in 2009 – which is also where he co-formed Migos. During his high school days, he played football until he sustained an injury that forced him to stop the sports entirely. Offset co-formed Migos with his close relatives in 2008 when he was still in high school, the first name they adopted was Polo Club before they settled for Migos. Though the single that gave them the much-needed recognition was released in 2013, the group had earlier released their first mixtape titled Juug Season on August 25, 2011, without much acceptance. Their second mixtape, No Label, assisted by Tucker Toenjes and Mitchell Thomas was released on June 1, 2012, yet, it didn’t give them the needed breakthrough. The year 2013 was a remarkable one for the group following the release of the single Versace which was produced by Zaytoven and peaked at number 99 on the US Billboard Hot 100 chart. The same year, they released another mixtape, Y.R.N (Young Rich Niggas) which had their chart-topping single Versace in the album. Their debut studio album, Young Rich Nation was released in 2015 and it contained a classic single, Bad and Boujee. The single was said to be Offset’s brain child and it peaked as No. 1 on the US Billboard Hot 100 chart. They followed this up with their 2nd studio album Culture on January 27, 2017. The album was again widely received, debuting at No. 1 on the US Billboard 200 chart. Rapper Offset has collaborated with other top artists including his wife, Cardi B and his cousin, Quavo. Others are Gucci Mane, Drake, Metro Boomin, Huncho Jack, 21 Savage, Future, Young Thug, Lil Yachty. Some of their collaborations include 2017 single titled No Complaints, which later spotted at number 71 in the Billboard Hot 100; Patek Water, Who Wants Smoke, among others. He featured 21 Savage and Metro Boomin in his first studio album Without Warning (2017). The album earned him his first Plantinum; Ric Flair Drip a song from the album was 3 times platinum certified by RIAA and it also debuted at number 4 on the US Billboard 200 chart while it topped the US Raps Charts. Apart from his contributions to the industry, he has also made headlines for negative reasons. He was indicted in a theft case that landed him in Dekalb County prison in 2013. He was later arrested again and charged alongside his group members; Takeoff and Quavo for illegal possession of drugs and firearms in 2015. Offset was found guilty and was remanded in custody for 4 months. A part of his lyrics in the song Boss Life which he sang with YFN Lucci brought him under public fire as the lyrics “I cannot vibe with queers” were termed homophobic to which he later extended unreserved apologies to the gay community through his Instagram page. With a successful career so far, Offset (rapper) has added himself to the list of millionaire rappers. He and his group members, the Migos are known to move around with lots of cash which they spend at will apart from the many ‘blings’ he wears around his neck. Aside from various tours and the group and solo records, he launched a cancer campaign in loving memory of his granny, Sallie Ann Smith and they raised $500,000. His current net worth pegged at $16 million. Offset has been linked to many women in the past and a few of them have actually become his baby mamas. He was married to Cardi B, who he met on February of 2017 in New York. Cardi B confirmed the status of their relationship via a video she shared on social media when the pair was on a date, on the 2017 Valentine day. After dating for a few months, Offset and her were quietly wedded in September 2017 but he publicly proposed to Cardi B with a golden ring at Power 99’s Powerhouse concert in Philadelphia in October 2017. Then in July 2018, their daughter Kulture Kiari Cephus was born. She is Offset’s 4th child but sadly, on December 5, 2018, Cardi B told the public she had split with the father of her child as a result of a text message to another female rapper Cuban Doll aka Summer Bunni with whom he was planning to cheat. Thankfully, the duo is patching things up as Offset had vigorously pursued his lovely wife with series of heartfelt apologies since the day he erred and with promises of being a better husband and father. The duo was seen partying in Atlanta at the Big Game Weekend party on 1st February 2019. Offset’s past love affair with Justine Watson produced his son, Jordan. Justine Watson in August 2017 filed a lawsuit against the rapper demanding for increased child support. The rapper’s other kids are; a son Kody and a daughter Kalea Marie. The identity of their mothers remain unknown to the public. Offset Height – How Tall Is The Rapper? Offset stands at the height of 5 feet 8 inches (1.75 m) while his frame is held up by his weight which is measured at 78 kg (172 lb).